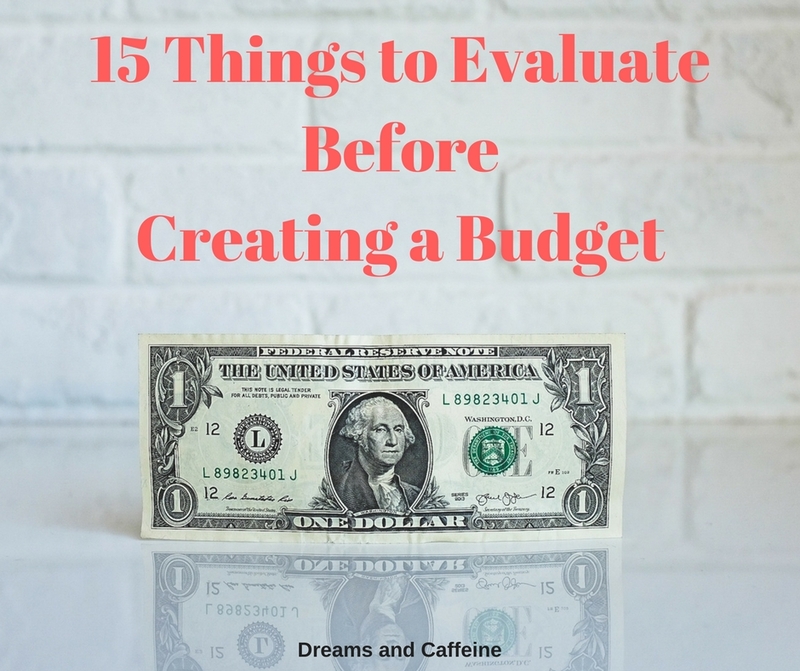 15 Things to Evaluate BEFORE Creating a Budget… boy, typing these words makes me realize I am finally adulting and doing it well! Before we jump into this post head first, I want to discuss a few things. Budgeting has never been my strong suit nor has it ever been something I have strived to do. 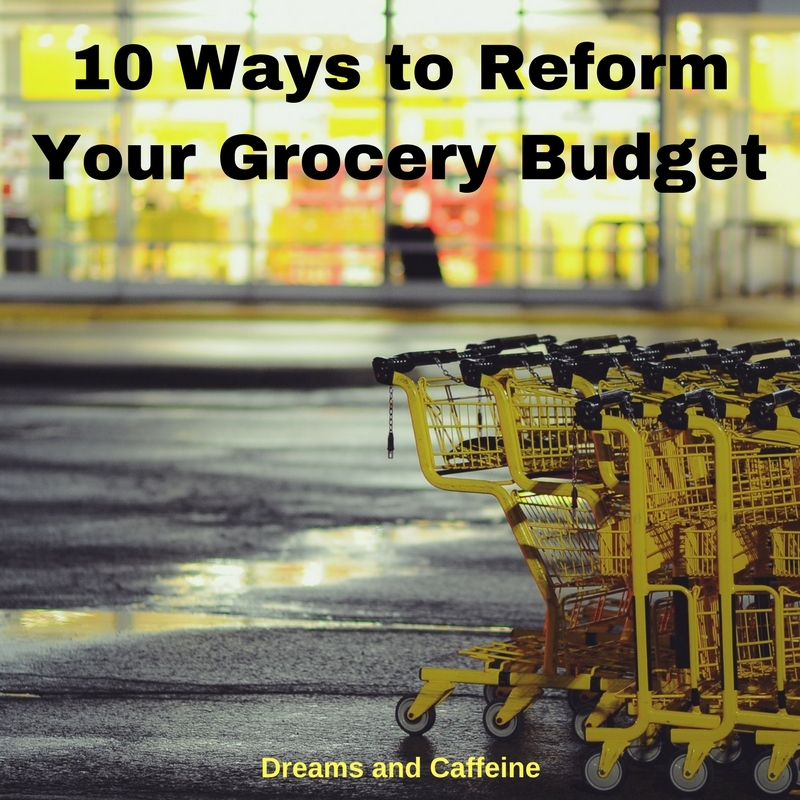 I always thought budgeting put restraints on your lifestyle, and that was something I was not a big fan of. Since we had always been a two-income household, budgeting was never a huge focus. Then, right before our lil’ Moose was born, I lost my job. Talk about panic time! 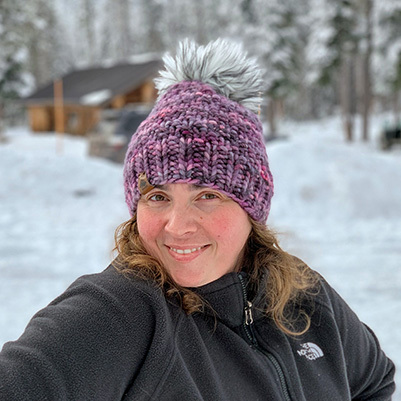 Thankfully, after some research, getting organized, and revamping our financials, we realized we could still live the lifestyle we wanted and flourish with one income. 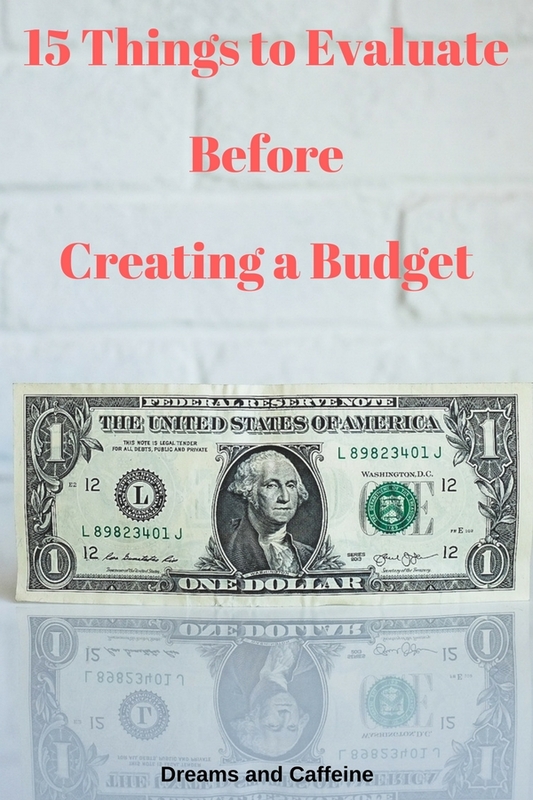 With the success I have had with implementing my budgeting strategies and getting organized, I decided I really wanted to share them with my readers. I will admit, this post is not for the frugal person that wants to live a minimalist lifestyle, in a tiny home, and only eat bean and cheese burritos. I’m all about cutting costs and figuring out how to save a penny here and there, but we still do splurge and go to Starbucks, dine out more than we should, and buy toys that our children do not need but want. These tips are really for the person that wants to find ways to save a little extra, waste less, and know and be accountable for where their money is spent. What are your mandatory costs? These items are things that cannot be avoided and must be paid each month. For example, a mortgage or rent payment is a necessary cost to avoid having to move. However, spa appointments or carwashes are not necessary costs. When is each bill due? It is important to know exactly when each bill is due and how much is due at that time. Also, are there penalties to being late? If so, what are they? If the due dates don’t fit well within your pay dates, be sure to contact the source and see if you can move the due date. How much do you make each month? When are your pay dates? Does your income fluxuate from each paycheck or are you salaried? When do you get paid? How often do you get paid? Are taxes taken out or are you responsible for saving for income taxes? Does your pay fluctuate? Are there times or seasons you must worry about down time? If so, this would be a great time to map this out and plan your budget accordingly. Do you have extra income from another source (Etsy, garage sales, craft fairs, child care, etc.)? Are these streams of extra income more consistent during certain seasons? If you can, map this out as well. Unfortunately, attending events, celebrating holidays, birthday ventures and vacations all take money! It is imperative to plan for these events. By planning and including them in your budget each month, you are much more likely to stay within your budget. It will also help prevent unnecessary splurges that don’t fit within your budget. Of your mandatory costs, what can you reduce? I suggest calling each place and discussing if there is a way to reduce your monthly bill. A great place to start is insurance… just be sure that you don’t also reduce necessary coverage. You want to save money, but not play Russian Roulette. As painful as this might seem, you need to write down every penny of debt you, your partner, and your family has. Write down interest rates, due dates, and anything else that is imperative to know to pay off your debt. This was groundbreaking for me and my husband! To say the least, we had no idea how much money we were wasting. After recording our spending for less than a month, I found so many ways that we could easily save without changing our lifestyle that much. It was very enlightening. Make a Menu… and STICK TO IT! Saturday – Dine outIn the beginning of my menu planning days, I only planned on dinner and then I just made sure to have items for breakfast, lunches, and snacks. As menu planning got easier and I became more efficient, I started planning more meals and snacks. Make a grocery list of items you need to make your meals, but be sure to check your pantry before making your list. There is nothing more irritating than realizing I wasted money on duplicate items. Do not shop while you are hungry, the store is super busy, or if you have cranky children with you. Also, be sure to have coupons ready to go (check expiration dates and any requirements for the coupons), use ibotta, and consider buying generic. How often are you going to the store? I recommend trying to reduce the number of times you go to the store. It will save you transportation costs and reduce the opportunity to buy items that are not necessary. Being organized and budgeting go hand in hand. It is hard to not to buy duplicate items if you can’t find anything in your pantry, or if you don’t know how much you spent yesterday before you lost your spending log. Take the time to get organized and budgeting will be easier. Make sure everyone has the same goal and is on board the budget train! 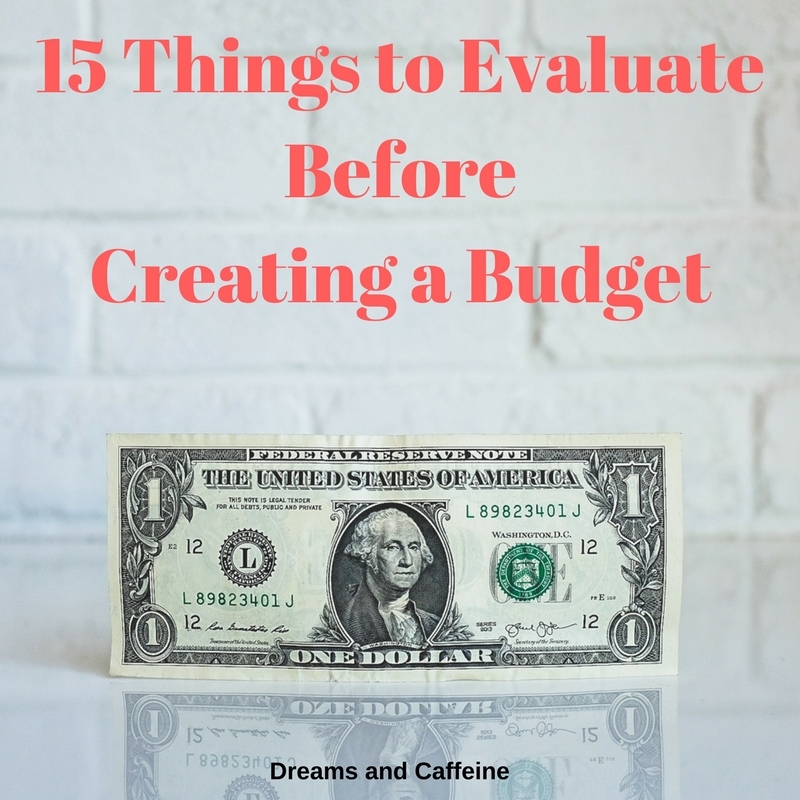 It is great you are ready to budget like a champ, but if your partner isn’t, the budgeting journey is probably going to be bumpy. Like anything else in a relationship, you have a to be on the same page to make it successful. If your partner isn’t there yet, maybe start chatting about wanting to start budgeting and all the positive reasons why it’s great for your family. You could even start with just one thing… kind of get their feet wet before diving in head first. Execute, and Be Accountable and Consistent! If you are anything like me, this one is probably the hardest! I am amazing at making lists, plans, and even having a process, but I am not always great at executing. Be sure to have check points and if you have a partner that you are doing this with, have weekly meetings to make sure you are both staying on track. Phew… made it through the list! I really hope you find these tips useful and that they help you save a few extra dollars each month. Cheers to a penny save! Oh man… spring is in the air and Mother’s Day is just around the corner. If you are like our family, we are gearing up for a fun-filled day that includes a delicious brunch and yummy desserts. One of our family’s favorite things on the brunch menu are croissants! Seriously… the buttery goodness, can it get any better? Well, unfortunately for your waistline, it can! 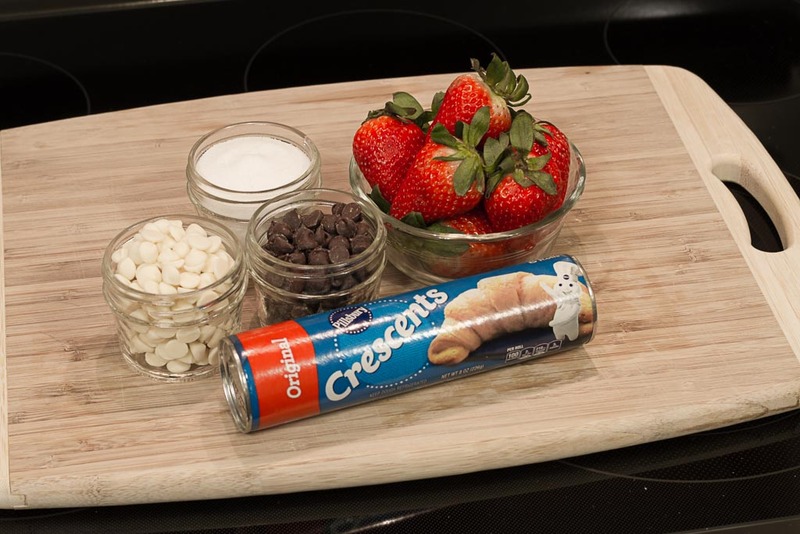 Enter… Chocolate Covered Strawberry Croissants! Doesn’t the name just make your mouth water?! Loosen your belt my friend and cut ties with the bathroom scales, because it is a croissant stuffed with chocolate and fresh strawberries. Then to make your scales scream, there is chocolate drizzled on the outside. You might be thinking that these are too time consuming or expensive to make, but you are wrong! They are easy to make, there are very few ingredients, and they are not expensive (I will note that strawberries this time of year are a little ridiculous in price, but that is just me ranting!). Step 2: Grease 13” x 9” baking dish and set aside. Step 3: Wash and slice strawberries and set aside. Make sure to cut them small enough so you can fit a few pieces in each croissant. Step 4: Gather your chocolate chips and set aside. Be sure to have a decent sized work area when you go to assemble the Chocolate Covered Strawberry Croissants. Step 5: Open the croissant package, then take the first one and lay it flat in your work area. Step 6: In the middle of the croissant, put a couple pieces of sliced strawberries and a few chocolate chips and then roll the croissant like you normally would. Repeat with the rest of the croissants. Step 7: Place the raw croissants in the greased baking dish leaving room in between them, since they will get bigger as they bake. Step 8: Take the sugar and sprinkle over each of the completed croissants. Step 9: Place baking dish in the preheated oven uncovered and bake according to the directions on the package, erring on the side of caution, I checked mine around the 7 minute mark to gauge how much longer they needed to bake… keep a close watch. Step 11: Take about a cup of chocolate chips and melt them in the microwave. Step 12: Drizzle the melted chocolate over the tops of the freshly baked croissants. Step 13: Grab one along with a glass of much deserved champagne and enjoy… just make sure to leave some for brunch! 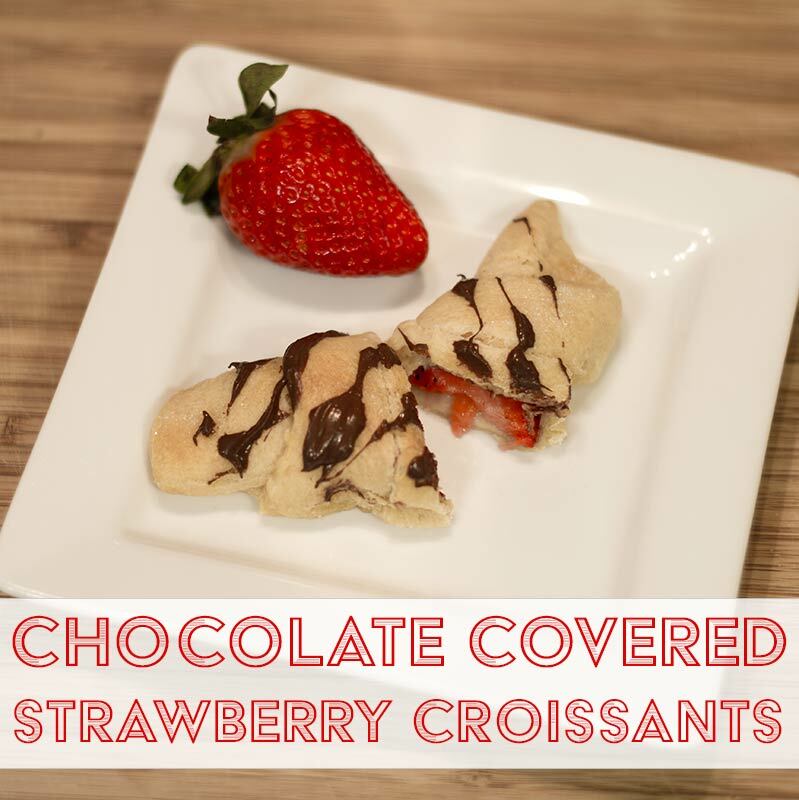 There you have it… easy to make, bakery-style, delicious Chocolate Covered Strawberry Croissants! I hope you give these delectable treats a try, and if you do, leave me a comment below. If you’re in need of a delicious drink for that special mom in your life, check out this recipe for the Holiday Sparkler, which can be made with or without champagne. I hope everyone enjoys spring and their Mother’s Day weekend! 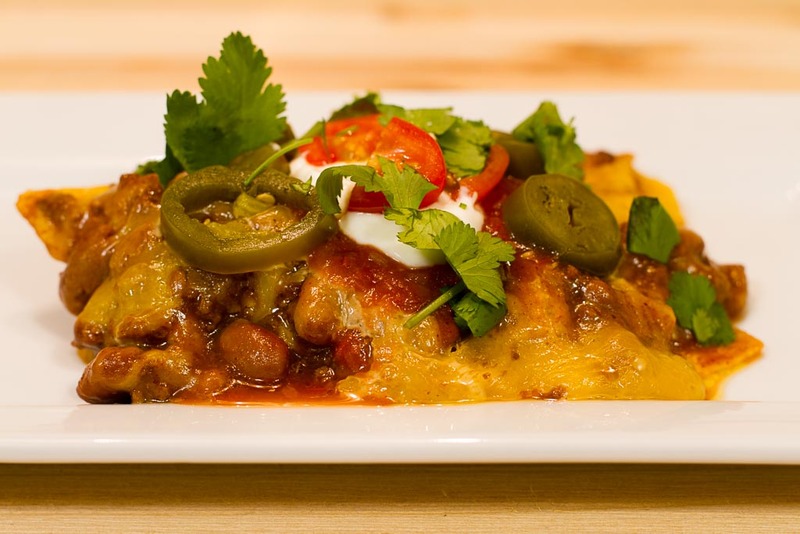 Fiesta Casserole… The Perfect Pantry Meal! 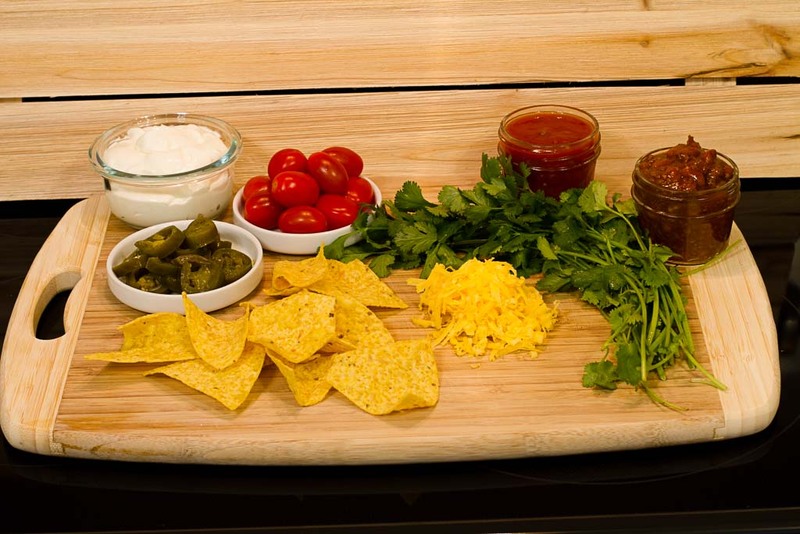 Fiesta Casserole – doesn’t it just sound cheesy and delicious before you even hear the ingredients?! I am going to share one of my all-time favorite comfort food recipes. Now, as many of you already know, I am not much of a cook, so if you’re looking for gourmet… you have come to the wrong place! 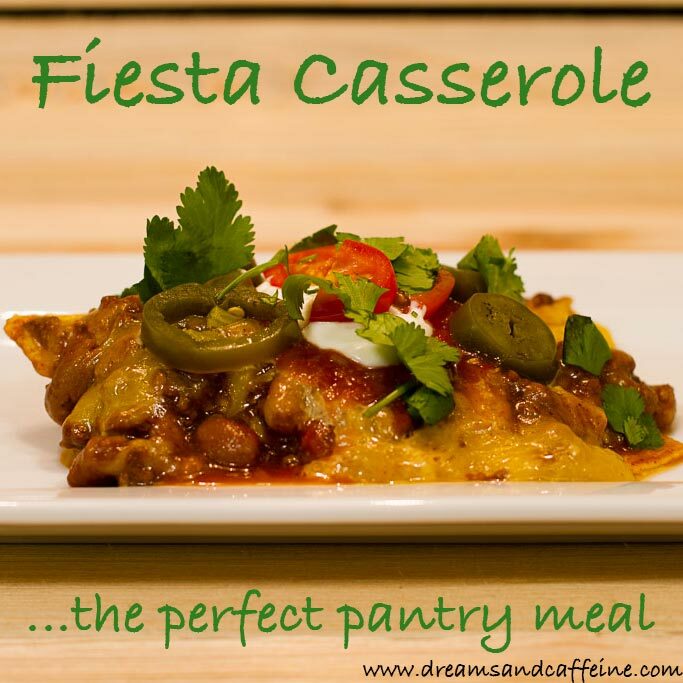 The Fiesta Casserole is a pantry favorite, and the simplicity is bliss especially after a long and busy day. This recipe is very flexible and easy to customize, especially if you don’t have something on the ingredients list. 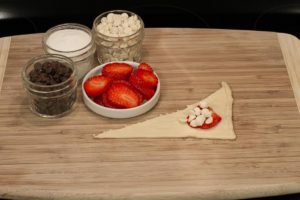 A few other wonderful things about this recipe is that it is cheap to make, the kiddos love it, and it is easy to clean up. All wins in my world! Cover the layer of chili with shredded cheese… don’t be stingy! Literally, a nap must follow from the deliciousness of this casserole. Thanks for stopping by and I hope you find this recipe as yummy as I do!